Being one of the most leading and prime companies in this line of work, we are availing our clients with one of the most exclusive kinds of Poultry Waste Incinerators. These Poultry Waste Incinerators are the giant machinery equipments which helps heat up and burn the waste items and degrade them to prevent any kind of pollution and un hygiene. We are one of the leading manufacturers and suppliers of high quality Chicken Waste Incinerator. These products are uniquely designed to ensure total burnout of solid and liquid wastes. These products are designed to work with a wide range of fuels such as LPG, natural gas, and fuel oil. These products undergo various quality tests at each level of production, to ensure high standards of quality. Being one of the most leading and prime companies in this line of work, we are availing our clients with one of the most exclusive kinds of poultry waste incinerators. These poultry waste incinerators are the giant machinery equipments which helps heat up and burn the waste items and degrade them to prevent any kind of pollution and Unhygienic. These poultry waste incinerators have been designed and constructed in most appropriate manner at our company which serves well for easy and quick incineration. We offer high quality Poultry Incinerators to our esteemed customers. These products are designed for large scale, municipal waste destruction. These products are offered at standard market prices. These products are manufactured using finest quality raw materials. These products have effective solid hearth to enable maximum burnout. These products are designed to work with a wide range of fuels. These products are manufactured using latest technology and advanced machinery, to ensure high standards of quality. This a Large incinerator and was designed for large scale and municipal waste destruction The unit has a 2.4 cubic meter combustion chamber, with a full top door for easy loading. The large secondary chamber provides a post combustion afterburner to provide a 2 second gas residence time at high temperatures to ensure that all gases are re-burn in the chamber. The whole unit is a 3 mm steel shell with a 8 to 10 cm thick refractory lining which keeps the heat inside the chamber whilst allowing cool walls on the outside. 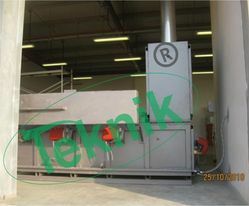 Looking for Poultry Waste Incinerator ?